This is a long forgotten dessert by us. When Jo bought me the white wheat beans, I thought they look so much alike with barley. Was craving for this for a long time. 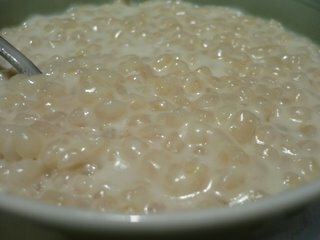 Bubur Terigu is a dessert I love in SG. I don't like the beans too soft, neither it to be too hard. In between the 2 would taste just nice. 1) Wash beans & set aside. Boil beans with enough water to cover in pot for 30mins or until soft. 2) Drain and set aside. 3) In another pot, add in coconut milk, 60ml water, sugar & screwpine leaves to boil. 4) When it boils, add in beans and cook for another 30 mins. All The Way From HOME!! !